There is simply nothing out there quite like the Google Chromecast. It's a brilliant and cheap way to get smart apps onto your older TV, and comes highly recommended. Chromecast is a media streaming device that plugs into the HDMI port on your TV. Simply use your mobile device and the TV that you already own to cast your favourite TV shows, movies, music, sports, games and more. Chromecast works with iPhone®, iPad®, Android phone and tablet, Mac® and Windows® laptop, and Chromebook. Your phone is a simple, powerful remote. Open the mobile apps that you already know and love to quickly access things such as your TV shows, your playlists, your queues. No new logins or downloads required. With Chromecast, you’re in command. Choose from over 200,000 TV shows & movies, 30 million songs, plus radio, sports, games and more. Discover a range of free, subscription or paid content from hundreds of apps. Cast exactly what you see on your Android phone or tablet screen to the TV. Your holiday photos and videos, favourite social media sites, presentations and more – now bigger than ever. 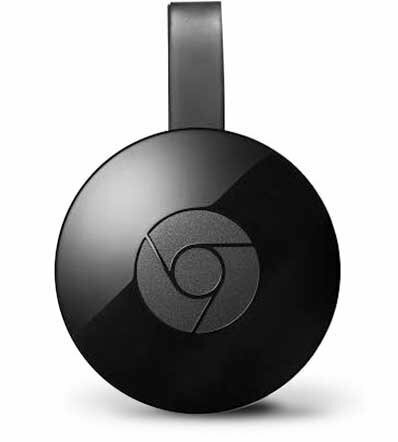 The Google Chromecast Media Streaming Device was added to the Media Streaming Devices category in June 2017. The lowest price GetPrice has found for the Google Chromecast Media Streaming Device in Australia is $61.00 from Mighty Ape.